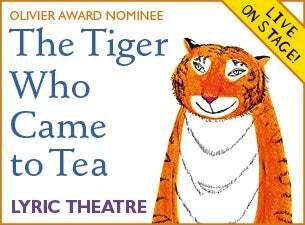 The Tiger Who Came to Tea returns to the West End in 2018 for a very special summer season, celebrating its 10th anniversary on stage and 50 years of Britain’s best-loved picture book! Join the tea-guzzling tiger in this delightful family show, packed with oodles of magic, sing-a-long songs and clumsy chaos! A stunning stage adaptation of the classic tale of teatime mayhem... expect to be surprised! Based on the book by Judith Kerr, this musical play is adapted and directed by David Wood OBE, who is undisputedly the country’s leading writer and director of plays and musicals for children. Suitable for children aged 3+, the running time is approximately 55 minutes (no interval). A stunning stage adaptation of the classic tale of teatime mayhem...expect to be surprised! Direct from a smash-hit West End season, the tea-guzzling tiger is back on the road in this delightful family show; packed with oodles of magic, sing-a-long songs and clumsy chaos! Ages 3+ / Running time: approx 55 minutes (no interval).